Drawn by India’s rich history, iconic temples and authentic cultural charm, travelers are often surprised by another notable aspect of India’s allure: the rich hospitality of her people. For hundreds of years, the elaborate palaces of India were home to royal families who hosted dignitaries and eminent personalities from around the world, introducing their guests to Indian hospitality and opulent design. 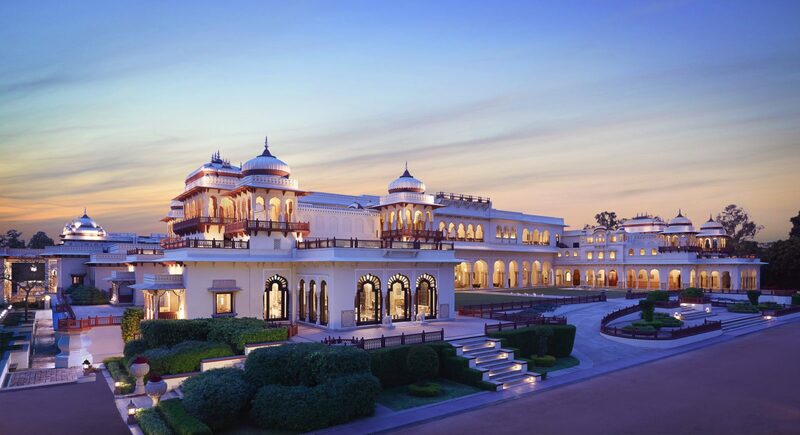 Today, these royal palaces and luxury resorts operated by Taj Resorts and Palaces offer the same level of hospitality to the most important guest in India: you. Taj’s commitment to treating travelers as royal guests, part of the culture of hospitality they call Tajness, is first evident in their commitment to “Spectacular Arrivals.” Upon arrival at Rambagh Palace in Jaipur, for example, guests are welcomed by decorated camels, horses and elephants alongside colorful dancers in traditional Rajasthani attire with Shehenai music. Within the grounds of each property, guests can take advantage of curated experiences, thoughtfully designed to share the rich history and luxury of Indian royals with modern guests. Heritage walks allow travelers to enjoy a glass of champagne while wandering through palaces under the entertaining tutelage of the resort butlers, eager to share the lore and legends of the historic properties and their storied guests. At many properties, guests can witness a traditional sunset ritual, watching property staff light lamps and candles as dusk falls. The littlest family members can even join resort-led adventures like cookie baking classes or peacock feather hunting around the property while Mom and Dad relax at the spa or enjoy a meal at an award-winning restaurant on property. Pair nights at regal palaces with daytime exploration of the cities and regions in which each palace or resort is centered. Our Travel Beyond consultants recommend activities that give travelers a feel for the pulse of Indian daily life. Meet with local artisans in Udaipur, enjoy a privately-guided street food tour touting the best flavors of Mumbai or board a rickshaw on a tour of Jaipur to immerse yourself in the local culture. In every location, learn about the longstanding traditions, fascinating history and status of modern life while viewing ancient temples and iconic sites. We’ve designed a sample 14-day trip to India that showcases some of our favorite Taj properties throughout the country and features activity and tour recommendations for each location. From the Blue City of Jodhpur to the Pink City of Jaipur, each location visited is bursting with color, history and culture. Our India specialists would love to share more about the diversity of experiences within the vast country, from city cultural tours to jungle safaris to relaxing spa escapes. To learn more about travel to India or the stunning portfolio offered by Taj Resorts and Palaces, contact us.